​“Auld Lang Syne” are words heard around the world at the stroke of midnight on New Year Eve. I wonder how many people realize that it was Robert Burns that wrote and composed that song. It is certainly one of his best-known songs that he wrote in his short lifetime. I have always had a fascination with Rabbie (this is the name in Scotland that he is always referred to as). So I will write about this romantic man who had a wandering eye for the lassies and wrote many a poem to his love of the moment. I wondered – did the lassies appreciate the poems that were dedicated to them? Then I realized, I certainly would if someone had ever written a poem for me. 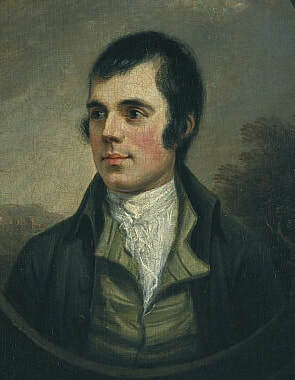 Robert Burns, often referred to as Rabbie Burns, was born January 25th, 1759. His father was William Burnes (note the different spelling), and his mother was Agnes Broun – another different spelling. It was often found in Scots families that the spelling of the last names were recorded differently. Rabbia was the eldest of 7 children. He was born in Alloway, Ayrshire. His father had built the house that he was born in, and he lived there for his first seven years, when his Father sold it. 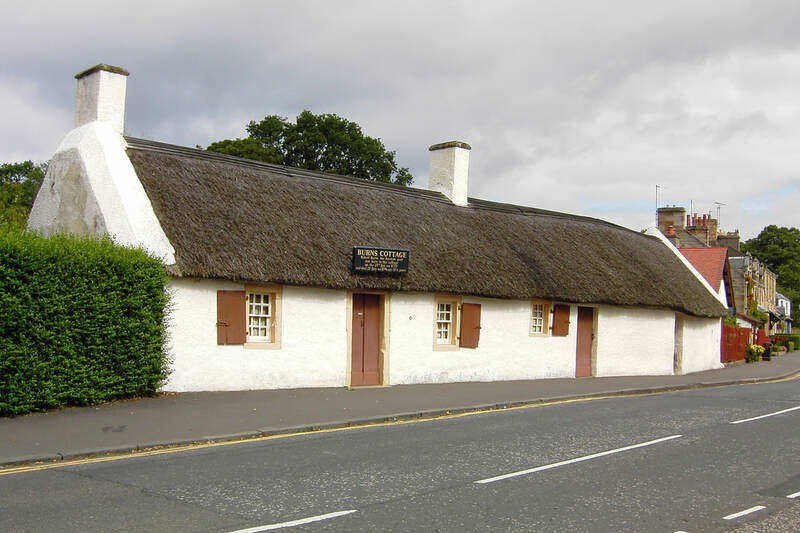 Today this house is the Burns Cottage Museum, and it is visited by many people. I have been there myself, and my memories of it are that it was a small place, but I was in awe of it. After all, Rabbie was Scotland's National Poet. Rabbie occupations included bard, (poet) lyricist, farmer and exciseman. After his father sold the house they all moved to a farm, as his father had taken a tenancy on it. Due to the hardship of working on a farm, Rabbie developed a premature stoop and his health weakened. Hard working conditions and long hours of labouring went into farming. ​His father was a very religious man and he wrote for his children a manual of religious beliefs. This was for their religious education, and this book was also published. Rabbie's tutor was John Murdoch. This is the man that also is given credit as the creator of his father's religious book. He then went to an Adventure School which John Murdoch ran, he was taught Latin, French and mathematics. He later went to Dalrymple Parish School before returning to help at the farm as full-time labour, only stopping for three weeks to study grammar, French and Latin. Even at a young age, Rabbie was a romantic lad. He met what he thought was his first love when he was 15. Her name was Nelly Kilpatrick and he was inspired by her to write his first poem "O Once I loved a Bonnie Lass." ​The following year he was sent to finish his education with a tutor and he met Peggy Thompson to whom he wrote two songs. "Now Western Winds" and "I dream'd I Lay." Once again his father moved to another farm in the village of Tarbolton a village in South Ayrshire. Much to his father's disapproval, Rabbie joined a country dancing school, taken up Scottish Folk Reels. He was then smitten by Alison Begbie whom he wrote 4 songs for. The more the man is smitten it seems the more he writes songs. He was even willing to marry Alison, she rejected him. Somehow I figure that Rabbie would not have dwelt on this rejection very long. He then moved again, this time to Irvine to become a flax-dresser. Unfortunately for Rabbie it was very short lived he started with the company the begining of December and while enjoying the New Year celebrations the place burnt down, once again out of a job he returned to the farm. When his father died in 1784 Rabbie and his brother Gilbert struggled to keep the farm going. They failed and they moved to Mossiel where they laboured an uphill fight for the next four years farming. This is when he met Jean Armour. Now Jean certainly liked Rabbie, and it seems Rabbie really liked Jean. Her father was not pleased with the relationship. He signed a paper attesting his marriage to Jean. Her father tore it up. During this time Rabbie met Elizabeth Paton. She was a servant to his mother. His first child was born in 1785, and she was named Elizabeth Bess Burns. With a number of children to support, Rabbie had taken a job in Jamaica as the bookkeeper for a sugar plantation company. His only problem was he had to find the funds to afford to get his passage there. While this was all happening he met another woman. Her name was Mary Campbell. He dedicated some poems to her, including "A Highland Mary" and "To Mary In Heaven," just to mention a couple. It was believed he wanted Mary to go to Jamaica with him. She was from Campbeltown. When her brother took ill she sailed back home to nurse him in Greenock. He was ill with Typhus, Mary caught it and was buried in Greenock. That was the year he found out Jean had twins and so he married her. This was his only marriage which took place in 1788. Jean bore him nine children, of which only three survived infancy. He was also encouraged to sell his poems so that he could get money. His success was immediate and soon he was a household name. He quickly cancelled his plans to go to Jamaica. He went to Edinburgh, and surprise, he met another woman. Her name was Nancy McLehose, and she was separated from her husband who was living in Jamaica. In order not to be found out they used pseudonym names as they wrote passionate letters to each other. ​She then decided to sail to Jamaica to reconcile with her estranged husband, and before she left, Rabbie wrote "Ae Fond Kiss" as a farewell. TOP PHOTO: Engraved version of Alexander Nasmyth's 1787 portrait of Rabbie Burns. I am sure Rabbie got over Nancy, but poor Nancy never got over Rabbie till the day she died. ​While in Edinburgh, he met Jenny Chow. She was Nancy's domestic servant, and she bore him a son. Then he had another affair with Margaret May Cameron, but this did not last long. During all this time he became a contributor to The Scots Musical Museum. He returned to farming in Dumfriesshire with Jean Armour. He had taken a lease on the farm and also trained as a gauger or exciseman in case farming continued to be unsuccessful for him. He was appointed to duties in Customs and Excise and eventually gave up the farm. Rabbie also worked to collect and preserve Scottish folk songs. This was a passion for him. His health was deteriorating and Rabbie died 21 July 1796. His son Maxwell was born the day of his funeral which was 25 July 1796. On his birthday each year, there is a Burns Night and these are held all over the world, although it is more widely observed in Scotland. Burns suppers have changed little since the beginning. It starts with a general welcome and announcements followed with the "Selkirk Grace." This came about when Rabbie was asked to say grace at a function and that was how it started. Sae let the Lord be thankit”. Next comes the piping in of the haggis on a plate, the cutting of the haggis, and the famous Burns poem "Address to a Haggis" being read and the haggis is cut open. At the end of the meal, a series of toasts are given again including a "Toast to the Lassies," and replies are made. Then a toast to the immortal memory and overview of Burns's life and work is given and concluded with the singing of "Auld Lang Syne". Rabbie had a total of 12 children and has over 600 living descendants. I cannot possibly give the number of affairs that he had. The ones I mentioned are well documented but I am sure there are more that are not.